Light on physics and math, with a heavy focus on practical applications, Optical, Acoustic, Magnetic, and Mechanical Sensor Technologies discusses the developments necessary to realize the growth of truly integrated sensors for use in physical, biological, optical, and chemical sensing, as well as future micro- and nanotechnologies. Used to pick up sound, movement, and optical or magnetic signals, portable and lightweight sensors are perpetually in demand in consumer electronics, biomedical engineering, military applications, and a wide range of other sectors. However, despite extensive existing developments in computing and communications for integrated microsystems, we are only just now seeing real transformational changes in sensors, which are critical to conducting so many advanced, integrated tasks. 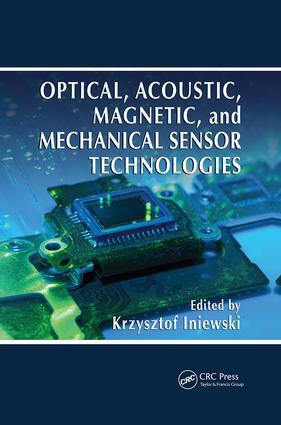 This book is designed in two sections—Optical and Acoustic Sensors and Magnetic and Mechanical Sensors—that address the latest developments in sensors. As sensors inevitably become omnipresent elements in most aspects of everyday life, this book assesses their massive potential in the development of interfacing applications for various areas of product design and sciences—including electronics, photonics, mechanics, chemistry, and biology, to name just a few.